Half of millennials don’t think the U.S. economy is strong, compared to 41% who say it is. Baby boomers are the most optimistic about the economy, with 59% saying growth is strong. 51% of voters say the economy is performing well, while 42% say it isn’t. 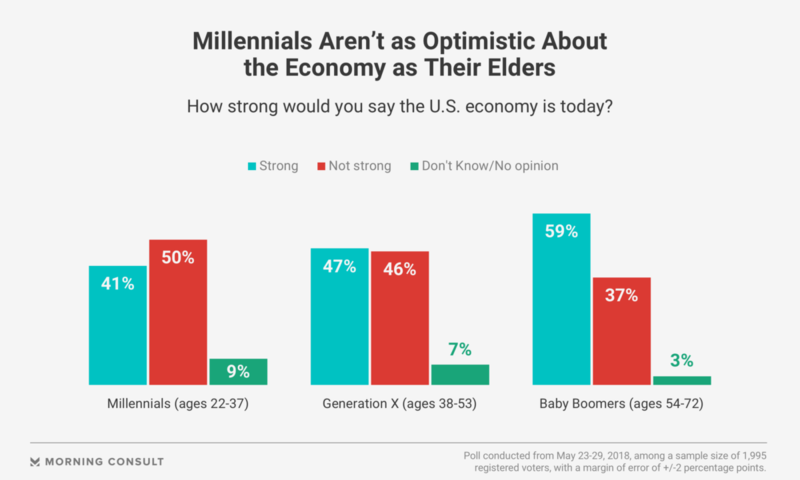 A majority of voters say the U.S. economy is strong, but viewpoints vary significantly by age group, according to a new Morning Consult/Politico poll. Fifty-one percent of registered voters said the world’s largest economy is either very or somewhat strong, while 42 percent said it’s not too strong or not strong at all. When broken down by age group, the figures appear to support research this month from the Federal Reserve Bank of St. Louis that suggests Americans born in the 1980s have had more difficulty accumulating wealth in the aftermath of the 2008 financial crisis compared to people born in earlier decades. Half of millennials — ages 22 to 37, many of whom were born in the 1980s — said the economy isn’t performing well, compared to 41 percent who said it is. By contrast, 59 percent of baby boomers — ages 54 to 72 — are optimistic, while 37 percent said the economy isn’t strong. Voters from Generation X — ages 38 to 53 — were almost evenly split, with 47 percent having a positive view of the the economy and 46 percent saying it isn’t strong. The U.S. economy expanded at an annual rate of 2.2 percent during the first three months of 2018 after expanding at a 2.9 percent pace the previous quarter, according to Commerce Department data released Wednesday. President Donald Trump has said one of his top economic priorities is to achieve annual growth of at least 3 percent. At a partisan level, economic optimism is strongest among Republicans, with 20 percent saying the economy is very strong and 49 percent saying it’s somewhat strong. Forty percent of Democrats and 47 percent of independents said the economy is moving in the right direction. The survey was conducted among a sample of 1,995 registered voters from May 23-29, with a margin of error of plus or minus 2 percentage points.